The SCC Middle School is pleased to announce this year’s yearbook will be bursting with photos, student portraits, activities, highlights, and of course, space for special autographs. The smiles and memories of your student’s year at SCC Middle School will be remembered forever in a yearbook. Make sure your student doesn’t miss out on this opportunity! 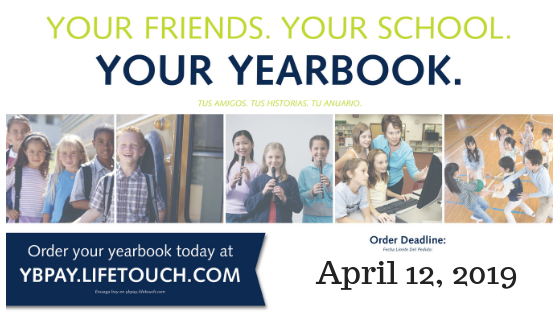 Order Online – Please visit ybpay.lifetouch.com and use the code 12160519. Online orders will be accepted through April 12, 2019. Yearbooks are on sale for $15, but there are special packages and add-ons you can purchase for an additional cost. Add-ons include upgrading to hardcover, autograph insert, current events insert, yearbook stickys, and personalized cover. We all look forward to a wonderful year—and an equally wonderful yearbook!